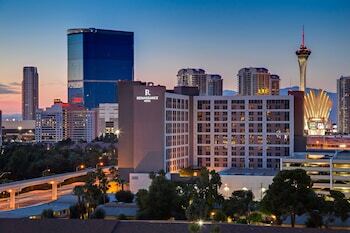 3400 Paradise Rd | With a stay at Renaissance Las Vegas Hotel, you'll be centrally located in Las Vegas, within a 10-minute walk of Las Vegas Convention Center and Hughes Center. This 4-star hotel is 1.1 mi (1.8 km) from Las Vegas Country Club and 1.8 mi (3 km) from Sands Expo Convention Center. Make yourself at home in one of the 548 air-conditioned rooms featuring refrigerators and Smart televisions. Your pillowtop bed comes with down comforters and Egyptian cotton sheets. Complimentary wired and wireless Internet access keeps you connected, and cable programming provides entertainment. Private bathrooms with separate bathtubs and showers feature designer toiletries and hair dryers. The preferred airport for Renaissance Las Vegas Hotel is Las Vegas, NV (LAS-McCarran Intl.) - 4.7 km / 2.9 mi. Stop by ENVY the Steakhouse for lunch, dinner, or brunch, where this restaurant specializes in American cuisine. Dining is also available at the coffee shop/café, and 24-hour room service is provided. Quench your thirst with your favorite drink at the bar/lounge. Buffet breakfasts are available daily from 6:30 AM to 11:00 AM for a fee. Featured amenities include a business center, limo/town car service, and express check-in. Planning an event in Las Vegas? This hotel has facilities measuring 20000 square feet (1858 square meters), including conference space. Self parking (subject to charges) is available onsite. The preferred airport for Renaissance Las Vegas Hotel is Las Vegas, NV (LAS-McCarran Intl. ).